A few weeks ago my nephew became engaged to my besties daughter. This event allowed me a rare opportunity to spend a few weeks with my brother and his family here in Miami. Although they live 1000's of miles away, thanx to technology we are in constant touch. I have grown to learn that distance does not matter if two hearts are loyal to one another. I keep a picture of them in my heart and carry it everywhere. Sounds a little mushy, but it's true. My brother's wife is like a sister to me. We laugh, we cry, we connect across the miles like there is no space between us. Coming from a large family has given us many opportunities to be together. The last two celebrations were of their son getting married, and my son getting married. I would say that is a great reason to scrapbook. Memories like that need to be recorded. Each time I look at the layouts I relive the priceless experience of being together. Any layout with hearts is sure to be a good one. As you can see here I matted the picture with a solid color and a print. Adding hearts with the same paper brings it all together. Cut out as many hearts as you can and add it to a layout. You will be sure to love it. I'm still recuperating from Pesach. Lots of wonderful things happening. My besties daughter got engaged to my brother's son. I'm also looking to make some changes in my working life. Life is full of ebb and flow. And while I ride on the wave of it all, I like to zone out! Lucky for me I have lots of creative outlets. Sometimes I can create in a way that zones me IN! Other times I create and I zone OUT! Zentangle/Doodles is my 'take me away' creative outlet. Only simple lines and circles that end up being....something! is the greatest gift you can give yourself? Only as an adult can you understand that zoning out is tuning in. Being oblivious to your surroundings means becoming aware of yourself. Life is a contradiction at times, just as we are. When I was younger contradictions made me feel unsure of myself. Now I feel inspired, stimulated, invigorated by seeming contradictions. I choose to define contradiction as paradoxically. A statement that seems contradictory or absurd but is actually valid or true. If you get that then you are an adult! Here are a few examples of my brain having fun. Started sketching this one while sitting on the beach by myself. This water color flower was inspired by another one of my favorite girls. Check out her blog . I even bought one of her classes. Some of you may think I'm crazy. Wondering how much time i have on my hands. Kitchen must be cleaned from dinner. Nothing more pressing needs my attention. Then and only then do I give my brain permission to fly. Creative beings are always looking to draw inspiration from somewhere. When I began scrap booking I subscribed to 2 wonderful magazines. Scrapbooks etc. and Creating keepsakes. I still love the days they come in the mail. I take my mags. to a quiet place and slowly study each page for new ideas and suggestions. (or just became a fan) of fellow scrapbookers. This week I will show you how to be inspired. It's almost the same as scrap lifting. And you don't have to wait for your magazine to come. There are a few ladies that I absolutely loooove because of their consistent style. Today I will introduce you to two of them. You will clearly see how I draw my inspiration from them and then make it my own. My daughter Rachel took some fun and funky pictures of her sister. There will be many different ways that I will be preserving these memories. Another one of my top 3 creative genius scrappers is this fabulous lady. I discovered her several years ago and she continues to fascinate me with her unique style. As you can see I don't have one style that I prefer to use to express myself. There are many moods to my work. Some of the time I like to work with straight lines. And other times I like to free fall! If you don't have it down pat yet, don't fret. The fun is in the search. That's what it's all about for me. The end result is besides the point. Welcome Spring into your life. I learned something this Pesach once again. I am so lucky to have my grandchildren with me. They remind me how to be happy. I always love ways to express happiness. Their joy simple and as authentic as anything could be. What do we learn from these innocent little people? Which brings me to my post. I borrowed this one today. It represents exactly what I want to express to you all. And I want to share this wonderful lady's blog with you anyway. She always finds the perfect way to create wonderful happy things with her children. THIS BLOG will show you exactly how to make these. What a great way to go into Spring. I know I am looking forward to find new ways to create scrapbook pages that reflect everyday happiness. That is what keeps me motivated. No matter how small, squeeeeeze the joy out of it until the memory is nothing but good. Take a paper right now and record something wonderful. Put the date on it. Here's one from last year. I think she is as cute as the lolly above. This is a great way to use a smaller photo. 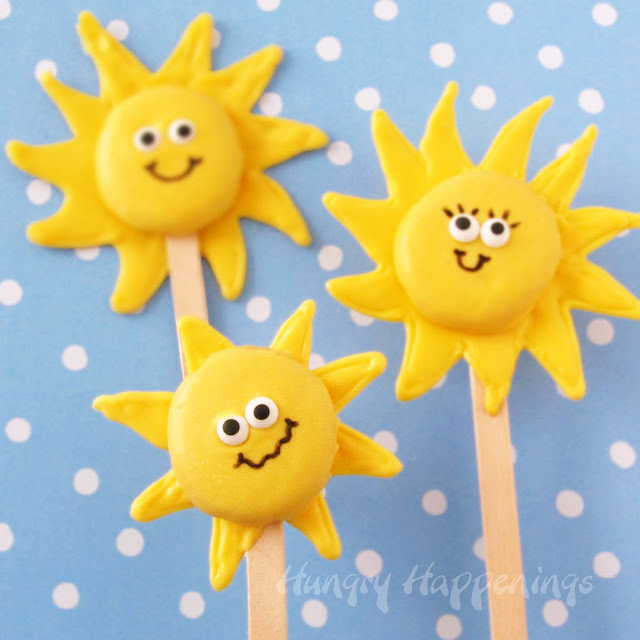 Make a lolly with a popsicle stick. Layer the photo with a brightly colored frame. Print the quote and cut each word seperately. Use three matching sheets of paper. I personally love stripes and dots together. Add any flowers, or circles to enhance your layout. Pay attention to details that enhance the main picture. And make a happy memory.